Last week came further news of China’s new 100,000-ton cruise ship, tentatively to be named China Xiamen, and among the names involved is not only Royal Caribbean but also Stephen Payne’s PFJ Marine Consulting, Finland’s Deltamarin, the Xiamen International Cruise Co Ltd and the Xiamen Shipbuilding Industry Co Ltd, as well as a new Southeast China International Shipping Centre and Xiamen International Cruise Terminal at Dongdu. Elsewhere, San Francisco will soon see a revival with a new cruise terminal under way and the arrival of a year-round ship from Princess Cruises. Finally, we have a look at new all-inclusive offers from Ponant and Fred Olsen. As reported by The Cruise Examiner last September, the Xiamen Shipbuilding Industry Co Ltd is about to build China’s first important cruise ship, a vessel of 100,000 tons and 2,000 berths. Since that report, however, a couple of facts have changed. First, the newbuilding price of $234.5 million, thought at the time to be low, has risen to about $490 million, and, second, delivery of the ship, reportedly to be named China Xiamen (alternative name: Mazu), has now been put back from 2014 to October 2018. But the most interesting news to come out of this project, which also involves a new cruise terminal and the establishment of a new maritime hub at Xiamen, is that not only is Royal Caribbean involved in an advisory capacity, but two of the world’s most eminent naval architects, Stephen Payne, designer of the Queen Mary 2, and Deltamarin, the Finnish ship designers, are also involved in this project. According to reports, Royal Caribbean Cruises Ltd will design the ship and serve as consultants during her construction, while the China State Shipbuilding Corporation will look after the shipbuilding and design research and Xiamen Shipbuilding Industry Co Ltd will build the ship locally in Xiamen. The Shanghai-based Shan Hai Shu Group, a conglomerate with a cruise tourism development partnership with Royal Caribbean International, will operate the China Xiamen through a subsidiary, Xiamen International Cruise Co Ltd.
PFJ is a firm of three partners, all of whom have worked in the past for Carnival Corporate Shipbuilding. Headed by Stephen Payne, the eminent naval architect who was involved in the design of fifty ships for Carnival Corporate and was awarded an OBE after designing the Queen Mary 2, the other partners are Jeff Frier, who also worked for a time for Norwegian Cruise Line at St Nazaire, during the construction on the Norwegian Epic, and Raoul Jack, whose last job at Carnival was as director of newbuilds for the latest Seabourn trio from Genoa, Seabourn Odyssey, Seabourn Quest and Seabourn Sojourn. Deltamarin worked for Royal Caribbean on both the Oasis of the Seas twins and the Celebrity Solstice class of four ships. And in the context of China, Deltamarin has also recently produced Clive Palmer’s preliminary drawings for his replica of the Titanic, supposedly to be built by the CSC Jinling Shipyard, a project so bizarre that we have not yet reported on it. Both the Xiamen yard, who will build the China Xiamen, and Jinling, who have been named to build the Titanic replica for 2016 delivery, were involved together with Shanghai Shipbuilding in the completion in 2002-03 of nine fairly sophisticated 30,000-ton multi-purpose cargo ships for Rickmers, each of which has accommodation for nine passengers, but neither yard has built a cruise ship. The China Xiamen will be built in pure Chinese style with eight Chinese restaurants and interior decor featuring antique furniture and traditional Chinese paintings. Compared to eight Chinese food outlets, there will be only one western restaurant. “With our own cruise liner, it will be easier to design cruise routes and develop our own tourism products,” said a spokesman for Xiamen International Cruise Co Ltd. The China Xiamen will reportedly focus on routes covering Japan, South Korea, Singapore, Vietnam and Taiwan. The so-called Southeast China International Shipping Centre package includes a number of projects, led by the construction of the 100,000-ton China Xiamen, together with an International Cruise Terminal in Dongdu and a new maritime hub in Xiamen. The total investment is said to be 16.73 billion Yuan (about $2.6 billion), of which the ship itself will only count for about a fifth. The package is aimed at boosting tourism and shipping in the Port of Xiamen, a city of about 3.5 million in Fujian province that was once known as Amoy. Amoy had a long history in shipping and today, as well as operating a large container port, Xiamen offers passenger routes to Hong Kong and Jinmen (formerly Quemoy), an island that is a part of Taiwan and less then ten kilometres away. Plans also call for a world-class shopping and entertainment cluster on the cruise terminal that is intended to have the greatest number of luxury stores in the world. The port’s new “Cruise City” will replace its old industrial belt, which housed the offices of shipping firms, trading companies and factories, as well as housing for workers. As one of China’s first special economic zones, Xiamen was mostly known for its export-oriented factories and large container port. But tourism has recently started to take off, putting the city among China’s newest travel and leisure destinations. The nearby island of Gulangyu, for example, a ten-minute ferry ride away, has its own resort atmosphere with the old colonial homes of Europeans and Japanese still lining the little island’s traffic-free streets. Xiamen was recently voted China’s cleanest city, and now has many attractions for the tourist, including surrounding countryside with spectacular scenery and pleasant tree-lined beaches. Last October, Xiamen became Royal Caribbean’s fourth Chinese port when the Legend of the Seas made a cruise to Hong Kong and Taiwan, while the Voyager of the Seas became the port’s largest caller earlier this year. Other operators presently calling at Xiamen include Azamara Club Cruises, Crystal Cruises, Regent Seven Seas and Silversea. The Port of San Francisco hosts sixty to eighty cruise ship calls a year, handling about 200,000 passengers. Itineraries include round trip cruises to Alaska and Mexico, as well as many Trans-Panama cruises in the spring and autumn, which either begin or end in San Francisco, and calls by world cruisers. At one time the port boasted the headquarters of the Royal Viking Line in its Embarcadero area. While cruises from San Francisco have recently been using the old Matson Line terminal at Pier 35, the port’s new $90 million Cruise Ship Terminal is moving towards completion, with the topping off earlier this month of the 65,000-square-foot terminal, designed by Kaplan McLaughlin & Diaz Architecture and Pfau Long Architecture. 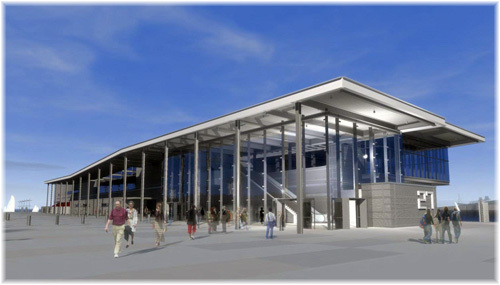 The new terminal, at Pier 27 adjacent to the city’s well-known Fishermen’s Wharf area, will serve as the primary cruise ship terminal, while Pier 35 will be used in future as a secondary terminal in the event that two cruise ships require berthing at the same time. The two-acre site on Pier 27-29 is being developed by the Port of San Francisco and will include a public park that will spill over onto the Embarcadero promenade on one side and border the bay on the other. The new terminal itself will be appointed with modern passenger amenities and will be able to handle the largest classes of cruise ship. It will also help reduce vessel emissions at the port by providing shore power to visiting ships. And not only is the new terminal designed to meet the long-term needs of the cruise industry but it will also allow for use as event space during the off-season. The first phase of the project is scheduled to be finished in time to provide space for the Race Village for the 2013 America’s Cup Finals and the Challenger Series later in 2013. Meanwhile, encouraginng news has also come from Princess Cruises, which now plans to base a ship year-round in San Francisco, a first for the line. The 2,600-passenger Grand Princess will move to San Francisco in May 2013 to sail a mix of cruises to Alaska, Hawaii, Mexico and the California coast. Princess says the Grand Princess will sail 10-day voyages to Alaska from San Francisco from May 10 to September 7, 2013, that will include calls at Juneau, Skagway and Ketchikan as well as Victoria BC; along with a visit to either Glacier Bay National Park or Tracy Arm. The ship then will operate the first of two sailings to Mexico on a new 10-day itinerary that features stops in Loreto and La Paz in Baja California – new ports for Princess. The itinerary will also include calls at Cabo San Lucas and Puerto Vallarta. Departures for Mexico are set for September 2013 and March 2014. The plans for the Grand Princess also include four California Coastal sailings that include calls at Santa Barbara, Long Beach and San Diego in California; and Ensenada, Mexico, with departures in September and October 2013 and March and April 2014. The dozen Hawaiian cruises will be 15 days long and feature calls at Hilo, Honolulu, Nawiliwili and Lahaina; as well as a stop in Ensenada, Mexico. Departures will between October 4, 2013 and April 28, 2014. Next month, August, sees four departures from San Francisco, all 10-day round trip sailings by the Sea Princess for Alaska, while September will be quite different, with deparures by Regent’s Seven Seas Navigator for New York and three Princess sailings, with Sea Princess sailing for Sydney on September 20, Star Princess for Mexico on the 26th and Island Princess for Fort Lauderdale on the 28th. October will see the Zuiderdam depart for Fort Lauderdale and the Star Princess undertaking two Hawaiian Island cruises, to be followed by two more in November, and a December 5 departure, also by Star Princess, for South America. 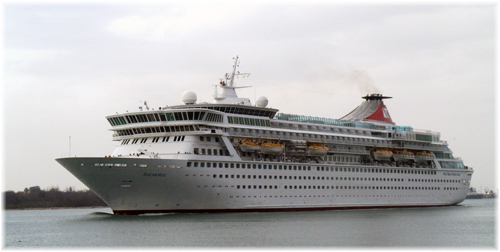 January 3, 2013, will see P&O’s Aurora depart for Australasia and the Far East while Cunard Line’s Queen Victoria will follow her on a similar route on February 3. Both ships will be calling at San Francisco as part of their annual world cruises. In March, Grand Princess will start her year-round service from San Francisco, with a cruise each to Hawaii and Mexico, and P&O’s Arcadia will ne heading for Southampton on her own world cruise. April will see two Grand Princess Hawaiian cruises while May will see three Grand Princess Alaska cruises, along with individual Alasks cruises by Oceania’s Regatta and Regent’s Seven Seas Navigator, back for another season. June and July then follow with three cruises each by the Grand Princess while other calls will be made by Celebrity Cruises, Crystal, Disney, Norwegian Cruise Line, Sliversea and Costa Cruises, who have returned to world cruising. Earlier this month came word that Compagnie du Ponant, which has just been acquired by Bridgepoint Capital of London, is going all-inclusive. In an effort to compete more readily with the likes of similar-sized ships operated by Seabourn and SeaDream, the line will now offer a simplified price structure. Its cruise fares will in future include all meals, alcohol, gratuities, port charges, taxes and fees, at least on bookings made in the US – although this is expected to be rolled out worldwide shortly. The only additional charges will be optional excursions, transfers and personal expenses. Cabins will also feature fully stocked mini-bars and 24-hour room service and fares will also include a welcome cocktail party. Then last week came news from Fred Olsen Cruise Lines that for any standard cruise booking made before the end of September for departure after April 6, the line would throw in a free all-inclusive drinks package. This package will not include gratuities however. The move follows a trial period on four limited-availability itineraries. The offer excludes world cruises and is limited to the first hundred bookings per sailing taken between now and the end of September. The offer will also be added retroactively to all applicable bookings. This latter offer by Fred Olsen is reminiscent of one of Thomson Cruises’ efforts last year to attract more bookings by offering free drinks packages on certain departures. Unlike Croisires de France in France and Pullmantur and Iberocruceros in Spain, who offer all-inclusive main market fares on all bookings, while the Fred Olsen program is limited to certain bookings only.